We thought we would continue with our recent images of the sea and its surrounding area with this photograph of Crosby Beach, Lancashire, UK. I have broken one of my photographic rules with this shot and that is to not shoot other peoples art. 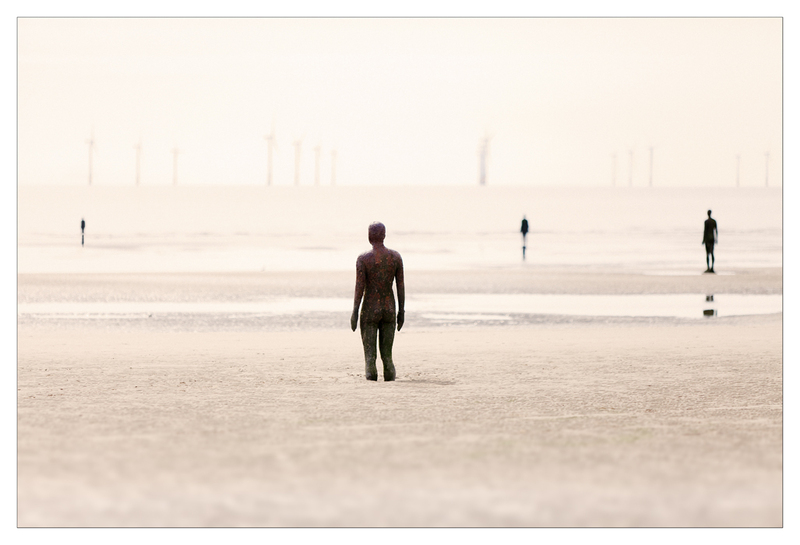 However, on this occasion, Antony Gormley’s “Another Place” exhibition, found on the UK’s North West Coastline just north of Liverpool, allows me to get away with it I think. This is because the statues are meant to form part of the landscape rather than sit on it. We walked the entire length of the beach to view the 100 identical iron men statues just after high tide and slowly the men appear as the tide recedes. As you sit and drink in the view, you are left pondering what it is they are doing. Are they awaiting the return of long lost loved ones? Are they standing guard, protecting the mainland from some unseen menace? Are they simply enjoying the view as we are? Whatever they are ‘intended’ to mean, you realise that whatever you think they are meant to represent, is what they represent as it’s the viewers choice, as with much art, to create the feel they wish. What is undeniable though is that the whole scene is calming and ‘gentle’ in a landscape that is anything but. They blend harmoniously with the gently turning blades of the many turbines on the off-shore wind farm, the gently lapping irish sea and the slowly moving ships coming in and out of the merseyside ports a few miles down the coast. I tried to represent this feeling of calm with the photograph. It was captured during mid-afternoon in mid summer. The sun was veiled in high cloud and the shot was taken using a medium length telephoto lens and minimum depth of field which leaves three of the figures out of focus giving the image a dreamy effect, in keeping with the scene and surroundings. Hopefully you agree and we have managed to demonstrate that sometimes, art can be represented photographically effectively!